Figure 1: The time evolution of tampered and untampered samples at FLASH was measured using femtosecond time-delay holography. The FEL beam irradiates the sample, initiating the reaction; the FLASH beam then reflects from a normal-incidence multilayer mirror back onto the sample where it once again illuminates the sample with a time delay of probing the reaction. 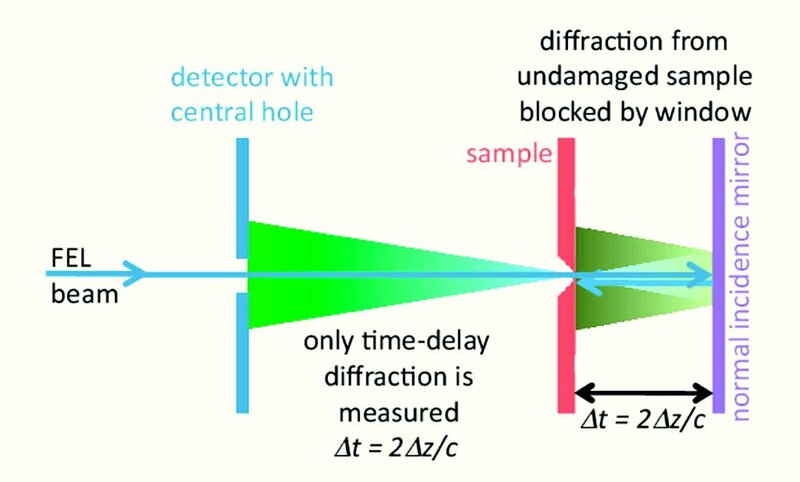 In an elegant twist, the prompt diffraction signal is blocked using a small sample window so only diffraction from the time-delayed sample is detected. 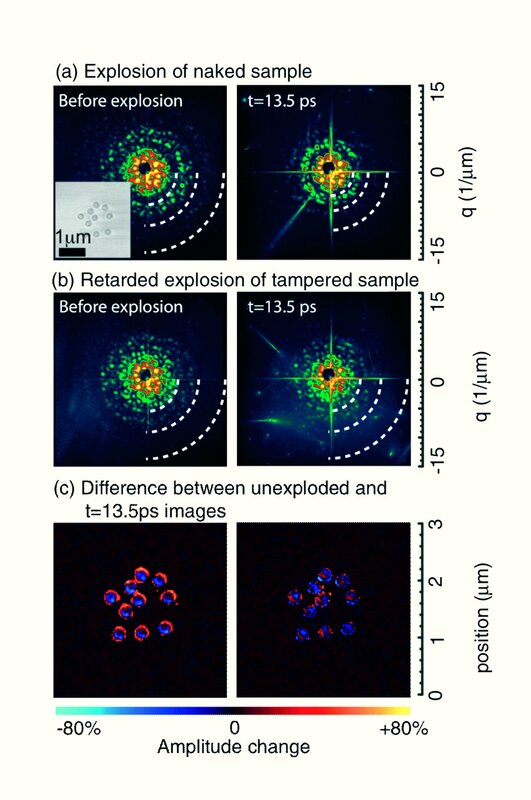 Figure 2: Diffraction from the naked, untampered sample (a) and tampered sample (b) before and after the explosion. Arcs highlight Airy-like diffraction minima in the measured data, from which sample expansion can be measured (contraction of the arcs indicates sample expansion). (c) Difference images of reconstructed structures taken with zero time delay and 13.5 ps time delay show density changes in the sample as bright colors: The untampered sample (left) shows large expansion, whereas the tampered sample (right) shows minimal structural changes. Published as: "Sacrificial Tamper Slows Down Sample Explosion in FLASH Diffraction Experiments", Physical Review Letters 104, 064801 (2010). Coating samples in a sacrificial external layer slows down the rate at which samples are damaged by the ultra-intense X-ray beam provided by the FLASH free electron laser. The extremely intense light produced by FLASH enables coherent imaging using single ultrafast X-ray pulses. The same intense pulse destroys the sample, and diffraction must occur before the X-ray beam significantly alters the sample structure, requiring ever-shorter pulses as resolution is increased. Experiments at FLASH showed that it is possible to delay sample explosion for up to picosecond time duration by coating samples in a sacrificial ‘tamper’ layer. This approach enables the use of longer and more intense pulses for high-resolution single-particle imaging, lowering the barrier to high-resolution structural studies on isolated biomolecules using shorter-wavelength sources such as the European XFEL. The goal of single particle coherent diffractive imaging is to achieve near-atomic resolution imaging of cells, viruses and macromolecules complexes without the need for crystalline periodicity . Because these samples have very weak X-ray scattering strength it is necessary to irradiate the sample with many photons - up to 1012 photons/molecule. In practice, the achievable resolution is limited by the degree of radiation damage to the molecule that occurs during the course of the X-ray pulse. In order to outrun radiation damage processes all these photons must be delivered within several femtoseconds. 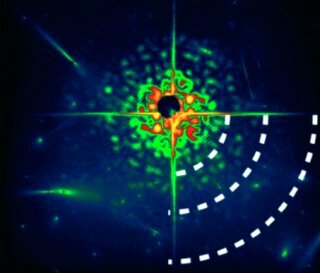 Rather than demanding ever-shorter X-ray pulses in order to outrun sample damage, techniques for mitigating the effects of radiation damage can both relax the demands on FEL pulse length and enable higher resolution imaging. For example, encapsulating the sample in a thin sacrificial tamper layer can retard the rate of radiation damage. The tamper layer serves two purposes: it arrests the hydrodynamic expansion through inertial confinement, and reduces the rate of Coulomb explosion by supplying a bath of photo-induced free electrons to the sample. This experiment provides convincing experimental evidence that tampering can prolong sample lifetime in the ultra-intense XFEL beam. The conditions in single molecule imaging, where a macromolecule would be encased by a water layer, were emulated at FLASH using pillars of aluminium lithographically fabricated on silicon nitride membranes, and overcoated with a silicon tamper material. At 13.5 nm wavelength the aluminium scatters and absorbs strongly. The silicon layer provides the surrounding mass necessary for inertial confinement whilst remaining essentially transparent and invisible to X-rays. Using an elegant variant of double-pass time-delay holography , X-rays from FLASH at 13.5 nm wavelength focussed to a 20 μm diameter spot provided both the drive pulse, first exploding the sample, and the probe pulse, measuring expansion at some time delay. By using small sample windows, it was ensured that only X-ray scattering of the probe pulse from the sample could reach the detector, as shown in Fig. 1. The time delay was precisely adjusted by translating a normal incidence multilayer mirror. The measured diffraction images, shown in Fig. 2, clearly show the silicon tamper retarding the rate of sample expansion: the untampered sample changes measurably in size over the course of 13.5 picoseconds time delay, whilst the tampered sample hardly changes structure at all. The tamper layer ensures the integrity of the sample for a period of at least 5 ps duration following irradiation with a 25 fs-long 13.5 nm FEL pulse, which is an order of magnitude longer than the pulse duration. In fact, the expansion of the aluminium pillars in 10 picoseconds was less than 10 nm, so that simple linear scaling to a pulse length of 25 fs may suggests a tamper restrains motion to about 1 Å during a 25 fs pulse. The concepts explored in this experiment indicate that the use of common tamper materials such as graphene or water in singleparticle bioimaging experiments will make the potential for atomic resolution even more achievable than previously believed. H. N. Chapman et al., "Femtosecond diffractive imaging with a soft-X-ray free-electron laser", Nature Physics 2, 839 - 843 (2006). H. N. Chapman et al., "Femtosecond time-delay X-ray holography", Nature 448, 676-679 (2007).